Get the most reliable and extremely low maintenance inverters by Exide. With extended cycle life and special hybrid alloy system, these inverters are good enough to withstand high ambient operating conditions that prevail in our country. These inverters start functioning as soon as there is a power cut and can be charged instantly once the power is back. EXIDE XPRESS 150AH-XP1500, Ideal for Generator, with high cranking power. Hybrid Alloy helps in withstanding the harsh Indian environment.Highly durable and leak resistant, comes with enhanced recharge capability and is ready to use soon after installation, Micro-porous filter disc locks acid fumes and restricts spark propagation and thus ensures safety. If you looking for any Exide batteries or inverters or Ups please get in touch with us as we have a branches all over in Hyderabad and we do door delivery as well. If you getting any call waiting while you calling please leave us a message with your requirement from make an enquiery from this website so that we will call back asap. MS Dhoni the (Brand Ambassador of Exide Industries ) records 100th ODI win as Indian skipper Mahendra Singh Dhoni on Thursday achieved the memorable milestone of recording 100 ODI wins as captain after leading India to a resounding victory against Bangladesh in the cricket World Cup quarter-finals Congratulations Team India and Special congratulations to MS Dhoni. These days lot of power cuts in Hyderabad specially in the morning hours. Get This Exide Inva Tubler to avoid power cuts at your home. For more details please call us. We have branches all over in Hyderabad. Exide InvaGo –Tubular Battery, Exide has launched its new inverter battery model ‘Exide InvaGo –Tubular battery’ last month.It’s not just one another tubular battery model; it’s an innovative product from the battery manufacturing giant Exide.Exide InvaGo battery is different from tradition tubular battery designs; it has a unique outlook and some useful customization which eliminates the need of inverter Trolley.Normally, more than 60% of users buy inverter trolley with Inverter& battery for home use, Exide InvaGo Inverter battery is provided with caster wheels at bottom to facilitate moving it like a trolley. It also has a slider tray at the battery top to place the inverter. This tray is carefully designed not to disturb the water topping process, which should be done periodically.This trolley type design of the battery itself denotes that this particular battery model is specially made for use with inverters/homeups. If you looking for any kind Exide products please get in touch with us, we have branches all over in Hyderabad. If you getting any call waiting while you calling please leave us a message with your rewuirement from make an enquiry so that we will call you back asap. Exide Inva Tubular Battery - IT 400 (115AH) Features, Ironclad® Tubular Technology Resistance to abuse, Electrolyte level indicator Tower type design, High Acid volume per ampere hour Common Side Venting, Deep cycle design Conforms to IS 13369-1992, Advantages, Very long life Can withstand overcharge better, User friendly Occupies less floor space, totally new loo, Acid volume per ampere hour is 30% more than that of ordinary tubular batteries. It acts as a coolant and also ensures very low maintenance Less pollution, environment friendly, Suited for use in areas of frequent power cuts (800 to 1000 cycles of deep discharge as against 300/400 cycles of other batteries) Ensures consistent quality, Application, The next generation Tubular battery designed specially for withstand long and frequent powercuts. 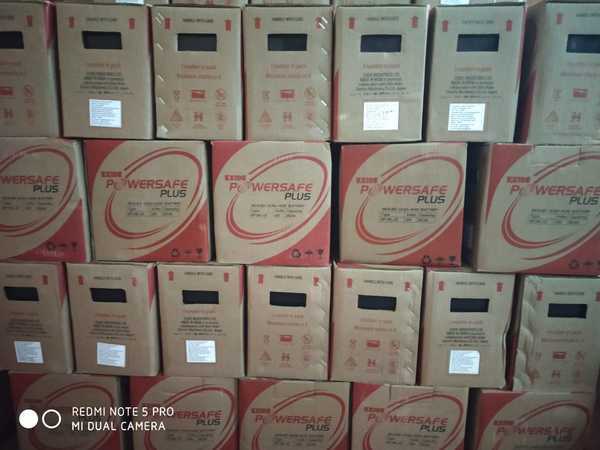 It is the ultimate Inverter battery, Load, 4 Fan, 4 Tube, 1 TV on 800VA Inverter, Backup - approx 3.5 hrs Free Home Delivery Given any where in Hyderabad.